Erode an image using grayscale morphology. Erosion takes the minimum of all the pixels identified by the structuring element. NeighborhoodIterator gives neighbors of the pixel. Definition at line 46 of file itkBasicErodeImageFilter.h. Definition at line 56 of file itkBasicErodeImageFilter.h. Definition at line 78 of file itkBasicErodeImageFilter.h. Definition at line 69 of file itkBasicErodeImageFilter.h. Type of the pixels in the Kernel. Definition at line 86 of file itkBasicErodeImageFilter.h. Definition at line 75 of file itkBasicErodeImageFilter.h. Definition at line 72 of file itkBasicErodeImageFilter.h. Definition at line 66 of file itkBasicErodeImageFilter.h. Definition at line 55 of file itkBasicErodeImageFilter.h. Definition at line 53 of file itkBasicErodeImageFilter.h. Definition at line 54 of file itkBasicErodeImageFilter.h. It will return the minimum value of the image pixels whose corresponding element in the structuring element is positive. This version of Evaluate is used for non-boundary pixels. 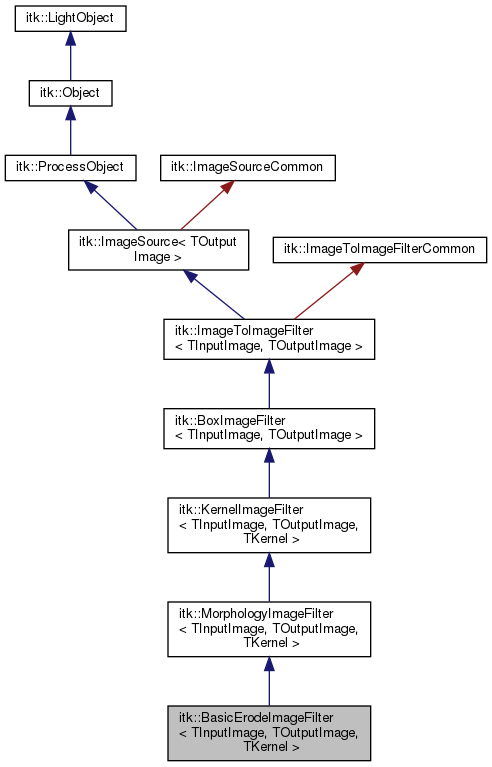 Reimplemented from itk::MorphologyImageFilter< TInputImage, TOutputImage, TKernel >. Definition at line 81 of file itkBasicErodeImageFilter.h. Definition at line 83 of file itkBasicErodeImageFilter.h. Definition at line 120 of file itkBasicErodeImageFilter.h. Definition at line 82 of file itkBasicErodeImageFilter.h.